People! Friday is here, and that means one very imporant thing: this week has been nearly survived. Insert loud exhaling noise here. Between the stuffy noses and the crying because teething is miserable and the househunting from afar and the tax refund check that is maybe lost in the mail? Well. What is that saying about just keeping your thoughts to your very own self unless they are nice ones? Right. But I did feel that I should explain myself if I was going to post a picture of my kid digging wax out of a candle holder with a coffee spoon. Which I found that I had to do because, basically, it was the only photo I took all week long. And really, it is kind of his favorite thing to do. If we are being honest. But there are other bits of news worth sharing, too. I've been working behind the scenes on a handful of little projects and posts for other people's internet homes, and coincidentally, they all seemed to appear in their finished form around the same time this week. Here they are, in the event that you want to take a peek. - I am pleased to announce that the first Sparkle Stories ebook has made its way into the world, and that I have teamed up with the ever wonderful David and Lisabeth to provide easy, practical (and yes, fun!) games and crafts to include in their books as they release them. This first book is full of some of our family's favorite Sparkle: a collection of stories from the Junkyard Tales series. You can find the book on Amazon here. - There is a new post up at Playful Learning today. I think that it will be of particular interest to any of you fellow bird nerds out there because I made you some printable birder's notecards. So go print them already! - There is an Alphabet Glue giveaway going on over at The Crafty Crow through Saturday evening. You can enter to win copies of the two newest issues of Glue, and there is a 20% discount code there, too- enter "crafty" at checkout through Sunday evening. - I know that I mentiond it earlier in the week, but the red paper canoes tutorial on The Crafty Crow can be found here. - And lastly, there are just a couple of days left to purchase the Learning Through Play ebook bundle. The kids' gardening resources that are included are fantastic, and are worth the price of the bundle just on their own. Also, it is about 28 degrees here today, so reading through those ideas on gardening with the small people is basically like getting a really cheap therapy session. Totally recommend it. Free Printable Valentines for You and Yours. I had ambitions early on last week to create a set of printable valentines to share with you all. Of course, it turned out to be a busier than normal week around here, and then someone (whose name begins with Z and who doesn't believe in wearing socks unless absolutely necessary) was mostly disinclined to let me settle down to work on said cards anyway. But then Annie 2.0 found herself stuck in a snowy grocery store parking lot with a dead car starter and a bag of tortilla chips on Friday morning, and after the small folk and I appeared on the scene for purposes of rescue, I found myself with an extra pair of adult hands around the house for the afternoon. And so: valentines for you. There are four different card options, as well as matching printable envelopes for each design. You can download the valentines and envelopes (in a five page PDF file) by clicking on the link below. Go ahead and spread the love. Now that Alphabet Glue lives in its own house and isn't just operating out of a back room of this blog, I often forget to look at my blog stats for long periods of time. And then something will remind me to check them out, so I'll take a peek and notice that folks have been digging through the archives looking for something in particular. Often, it is something seasonal. This week, it would appear that everyone is on the hunt for printable thank you notes for post-holiday acknowledgements. So with that in mind, I thought that I would take a quick moment to relink to the printable thank you notes that I made for you all last year around this time. You can find them here. And, might I also shamelessly plug the latest issue of The Glue just a little bit and remind you that there is also a nice set of printable thank you notes included there? Yes, I believe I might. They are Canada Geese-themed and come with fold-your-own envelopes too. And now there is officially no good excuse: your mother is checking her mailbox. 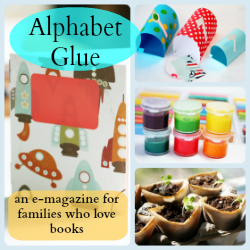 Alphabet Glue: Volume Ten and a Great Giveaway, Too! In the Glue Department: A Sneak Peek at Volume Ten. Alphabet Glue Vol. 10 Now Available! Small Business Saturday (an Alphabet Glue Sale!). Library Monday: Bridges Are to Cross. I've been spending just a bit of time thinking about bridges this week. Well, to be more accurate, bridges and tunnels. Because here in the San Francisco area, that is how one gets around. You cross bridges and go through tunnels. Generally, you do these things at the exact same time as many, many other people and therefore, you do them slowly. Which lends itself to a bit of thinking about how the bridges are built, how the tunnels are tunneled. This is especially true at the moment, because the new Bay Bridge is actively under construction and you can't help but notice the skeleton of this new bridge as you drive across the old one. Mariam seems to have noticed the built environment here in California a bit more on this trip than on previous ones, and the resulting car conversations reminded me of one of our favorite reads on the topic of bridges and the reasons that people build, cross and admire them. Bridges are to Cross by Philemon Sturges (illustrated by Giles Laroche) is a truly enjoyable read, with plenty of detail for mini-engineers who are curious about bridges and the way that they are constructed. As an added bonus, the text is accompanied by brightly colored cut paper illustrations that are themselves enough of a reason to pick this one up. Bridges Are to Cross got the Inspired by Literature treatment in Volume Three of Alphabet Glue, so many of you may have had a chance to give this one a well-deserved read. If not, click the link below for a PDF file containing the last couple of pages of Volume Three. You'll find a bit more information about the book, as well as a fun kitchen-table engineering project to go along with it. This morning, when I saw that Kara, from Simple Kids, had written a post wondering if anyone had a good "guerilla style" gardening activity to accompany Miss Rumphius, the lovely storybook by Barbara Cooney, my first thought was something like "Oh! I love that book!" And then, shortly after that, "Wait! I totally have a fun guerilla style garden activity to go with Miss Rumphius." Those of you who have a copy of Volume One of Alphabet Glue floating around your hard drive may remember the wildflower seed pods from that first issue . You see, Miss Rumphius was the first book to be featured in the Inspired by Literature section of Alphabet Glue, and for good reason. It a heartwarming and gently inspiring tale that reminds each of us that we are not only able, but in many ways responsible, for leaving the world a better place than we found it. It is one of those rare picture books that has something to offer readers of any and every age, and it is a permanent favorite of many families that I know, including our own. So, I thought that I would share the Inspired by Literature feature from Volume One of Alphabet Glue with you here today. Click on the link below to download a PDF copy of that section of the magazine; it includes a short review of Miss Rumphius, as well a tutorial for making wildflower seed pods to get your spring season started off in the spirit of making the world around you a little more colorful and bright. 'Tis the Season (Printable Thank You Notes for Kids). Between holiday festivities of various sorts and the much appreciated "big sister" presents that have come her way, my girl has some serious thank you note writing to do. I would love to tell you that she relishes this task and dives in without prompting, cajoling or the need for numerous reminders. However, this would be a bit untrue. Not that Mariam isn't grateful for the wonderful gifts that have come her way over the last few weeks, she certainly is, but she would probably rather build with her awesome new blocks than sit at the dining room table writing notes about how awesome they are. You see? So, in the spirit of making it easy to say thank you to those that certainly deserve the courtesy, I made up some simple printable thank you notes. Just download, print, cut out and fill in the blanks.